After turning the cheese daily for 6 days I've decided to leave it alone for longer periods of time. Today was the first time I looked at it in 3 days and found the beginnings of a little mold, which was expected. 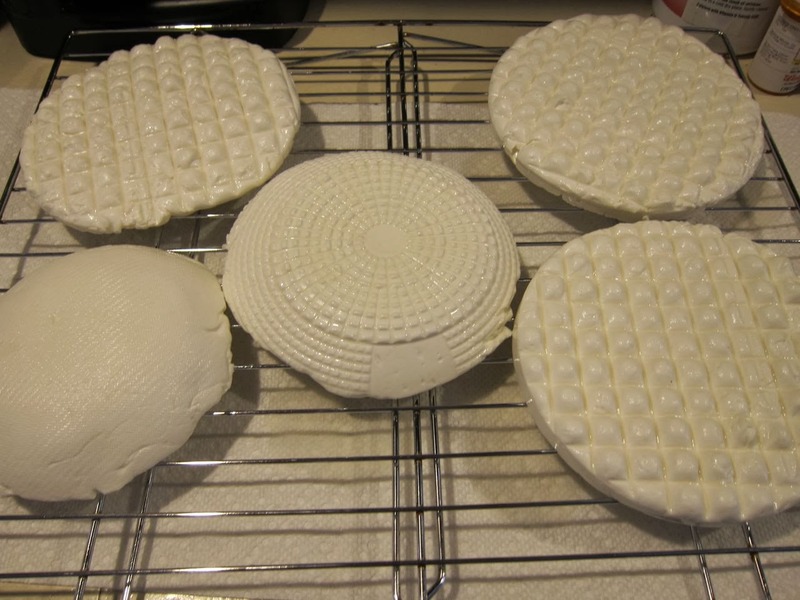 I washed the cheeses with a light brine, turned them, and sealed them back up. The texture seems a little softer, which is what I was hoping would happen. Progress! What a Christmas Eve dinner that was! even the 8 year old ate the duck and really enjoyed it! We also had a mixed rice dish and some green beans to round out the meal. The rest of the duck bones are now in the freezer with a plan to resurrect the Turducken soup. I decided we had to have some level of fancy dessert to go with all this savory goodness so I found this recipe for chocolate mousse and it, too, was glorious. And easy. And surprisingly rich for how light and fluffy it was. We are very full, and now we just have to wait for Santa! This morning I made the brine around 9:30 so it would be cool enough to work with by 10:30. I boiled 1 gallon of water with 36 oz kosher salt, 1 T. calcium chloride and 1 tsp. white vinegar. According to cheesemaking.com, I can keep the brine for future batches so I'll be storing it in mason jars, maybe in the fridge. Step six: (10:30 am) The cheeses were placed in the brine for an hour. 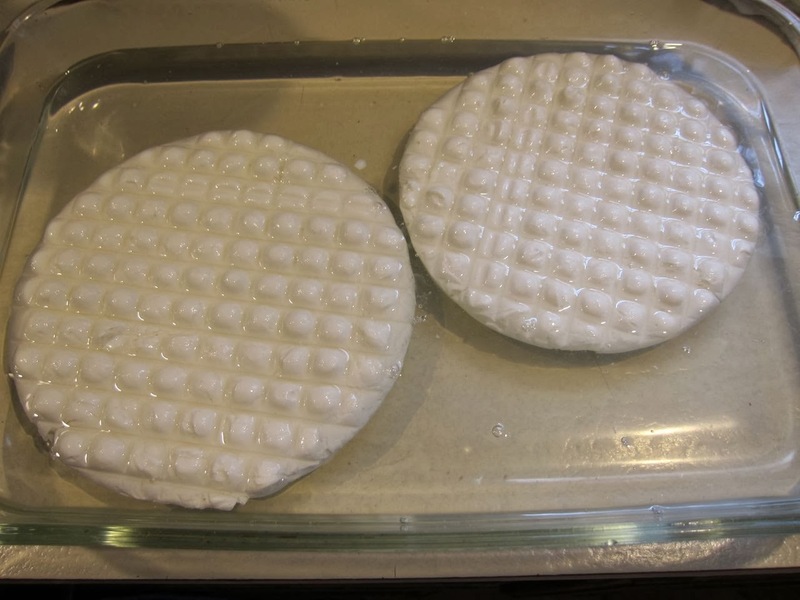 Step seven: (11:30 am) The cheeses were removed from the brine and put on a rack to dry. 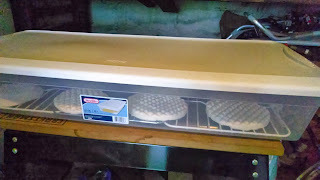 Step eight: (4:00 pm) The cheeses were placed in the bin on sterilized racks, two soaked sponges tucked in the corners, and placed in the garage. I'll check on them tomorrow evening. 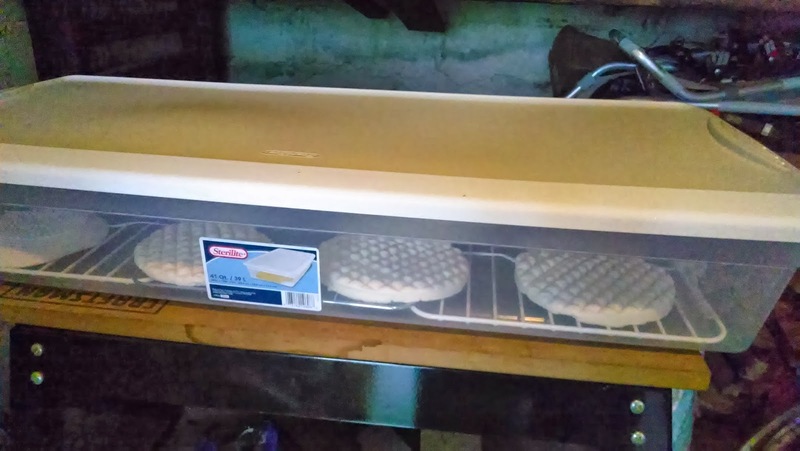 Now that the weather is cold enough outside, and my garage is reliably in the 50's, I can finally put my aged-cheese-making plan into action! For my first attempt, I'm making a robiola due latte. I'm using 1 gallon of goat's milk and 1 gallon of cow's milk. Since both are pasteurized I will be adding calcium chloride as well. 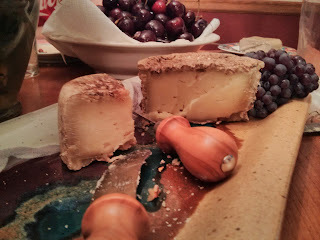 When we made cheese last spring, Paul recommended keeping notes for each batch so I'll do them right here, on my blog. Here goes! I started with the milk as listed above. The recipe calls for whole milk but I didn't see that the cow's milk I bought was fat free until I got it home. I contemplated adding a little butter but decided against it, figuring the goat milk had fat and maybe that would be okay. I have a jug of bleach and water mixture and I am sterilizing the utensils in that and letting them air dry before I use them. Step one: (noon) Milk was heated in a big pot until about 72 degrees, then 2 packets of buttermilk culture were sprinkled over the top. After 2 minutes, I stirred that in, covered the pot and let it sit for 4 hours. To keep it from losing temperature, since it wasn't in a hot water bath or anything, I put the pot halfway between the front and back burners on the stove and set the oven to warm. This way, the heat from the oven would warm up the back burner. This seems to have worked; I checked the temperature every hour or so and it was always 73-76. Step two: (4:00 pm) After 4 hours, I added 1/2 tsp. of calcium chloride diluted in 1/4 cup of water (that had been boiled to sterilize it). I then added 2 tsp. of my liquid rennet (more than the recipe called for, but my rennet is old and not the same formulation so I guessed a little based on the instructions on the bottle of rennet). The rennet was also diluted in a little sterile water. I stirred that in and waited 25 minutes with the oven now turned off. 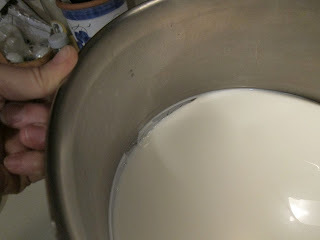 Step three: (4:30 pm) After 25 minutes the rennet seems to be working, there is a curd which I cut once with a knife just to check. Now I have to wait and check on it frequently until the whey starts to come to the surface. 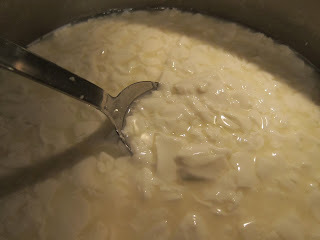 Step four: (8:35 pm) At this point the curds have a little bit of whey pooling on the top. The curds were cross-cut at 1.5 inches and then rested for 5 minutes. Then they were cut with a spoon and stirred gently for 5 minutes. 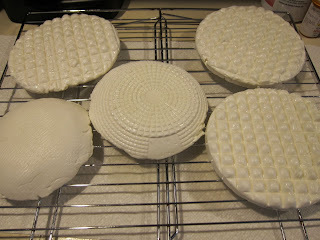 The curds then settled while I got the molds ready. I have 3 cheese molds and that turned out to be not enough, so I used 2 colanders as well, which are more like the basket molds the recipe suggests. Each mold was lined with sterilized butter muslin and then the curds were ladled into them. Once all the curds were divided among the 5 molds, they were wrapped with the cloth, flipped over, and allowed to drain for 10 minutes. Then they were flipped again, unwrapped and flipped again, then rewrapped. Now they're resting/draining for another hour. 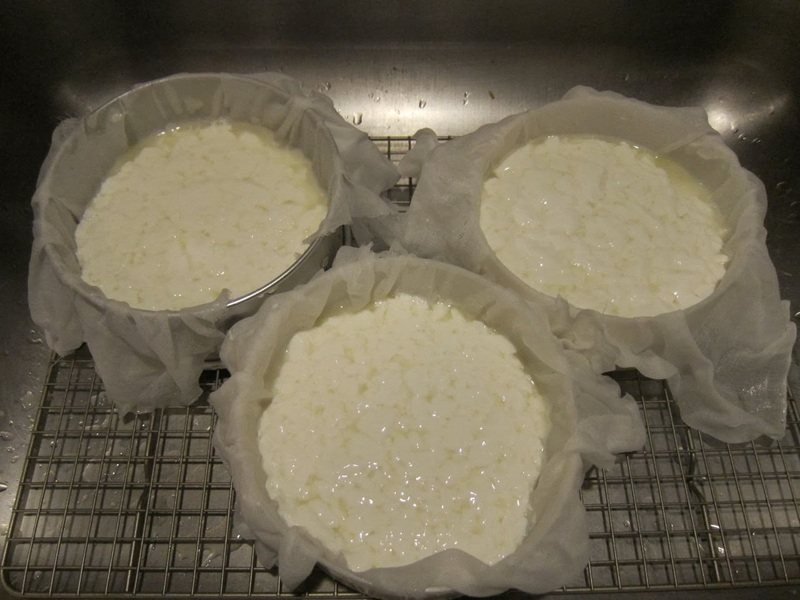 Step five: (10:35 pm) The cheeses have been unwrapped, placed back in their molds, and are draining overnight. I've covered them with clean tea towels while this happens. Tomorrow we brine. He was amazed at the sheer number of gifts. Now, I think, he understands why I start working on the gift stash in the spring. First up: my work colleagues. I've found that when I make gift baskets with jars of jam in them for the nurses' stations, there is this weird reluctance to open the jam. I'm not sure why, but maybe because once it's in the fridge no one really thinks about it or goes looking for it? Having dealt with that fridge, I try not to go looking for things in there, either. So the nurses' stations get cookies. But the docs and NPs and the administrative assistants get jam. That's 24 right there. I delivered almost all of them yesterday, and have a few more to go. Next is the neighborhood; that's another 20. Plus the various teachers, hairdressers, and other support people in our lives. It does work out to about 50 in total. If you include the gifts I give throughout the year, that's a lot of jars! Since my family doesn't all live in the same place and, since it's easier to travel before or after Christmas rather than during the holiday week, we have part of our Christmas celebration early. Today, as a matter of fact. I still had the pie plate from the chess pie my sister-in-law made for Thanksgiving so I felt it was time to return it, filled, of course, with pie! 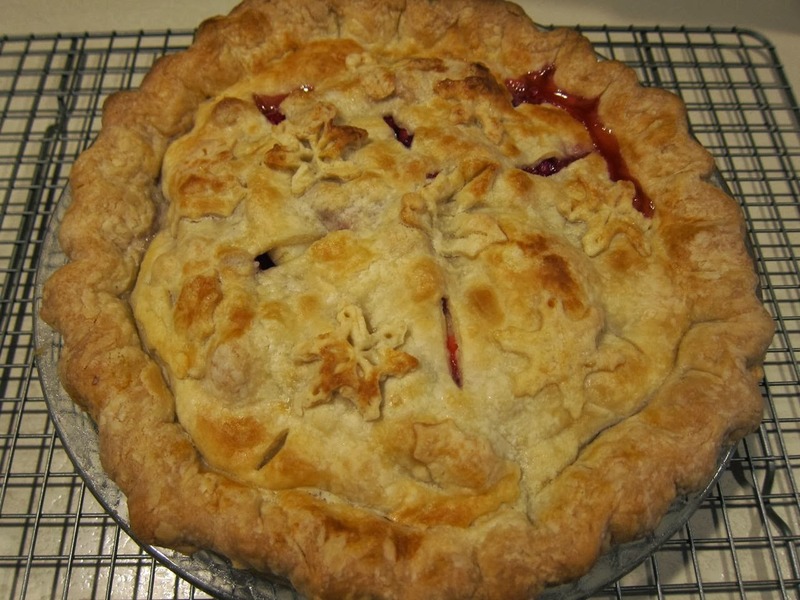 Today's pie is pear cranberry, from this recipe, but with the addition of some ginger. I say, "Some," because I just sprinkled. Maybe it was half a teaspoon, maybe a full teaspoon. Hard to say. I used my holiday pie cutters to put snowflakes and holly leaves on the crust. This crust was 1/4 leaf lard and 3/4 butter (I ran out of the lard) and it was more elastic than usual. I am not sure why that is. It was very interesting to work with, much more likely to stretch than to break. It came out nice and flaky and buttery tasting (we ate the accompanying tarts for breakfast). Now I can't wait to dive into the pie! Thanksgiving was wonderful, with lots of food and family and friends, and having a few days off equally wonderful. I have turkey bones and turkey meat in the freezer for soup making but just haven't had the energy to do it yet. What I do seem to have the energy for is breaking almost all my plates (the stack of clean dishes fell from the counter back into the dishwasher...) and, this morning, dropping the full sugar bowl on the floor. I have decided the universe is trying to tell me something - either I have too many things in the air (literally) or not enough sleep. Or both. Likely both. Anyhow, today's project was something I've been planning for a little while. I just needed pears to go on sale. I had a cup of black walnuts in the fridge from my little foraging expeditions, and thought the flavor would go really nicely with pears. Today I made 2 batches of Pear-Black Walnut Conserve - 12 jars in all. An excellent addition to the gift stash! 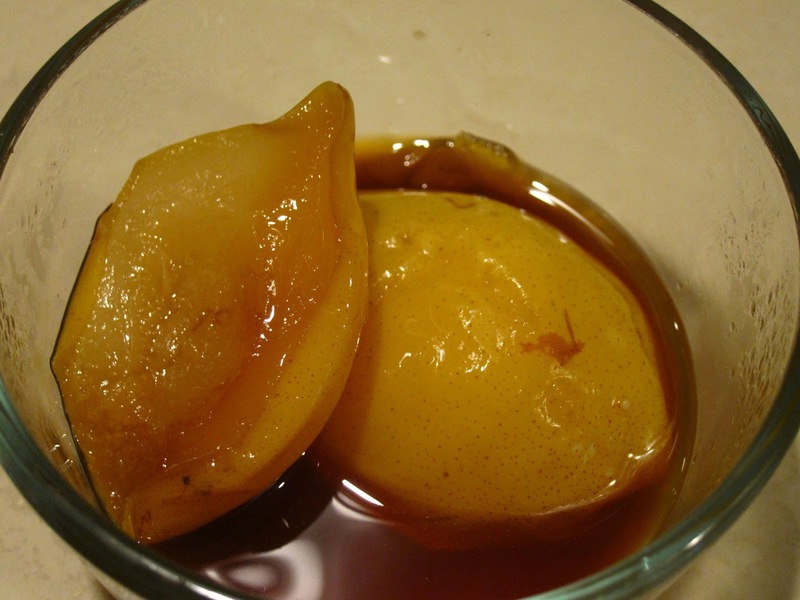 Cook the pears, lemon juice and pectin until hot, then add the sugar all at once. Bring to a boil and boil hard for 1 minute. 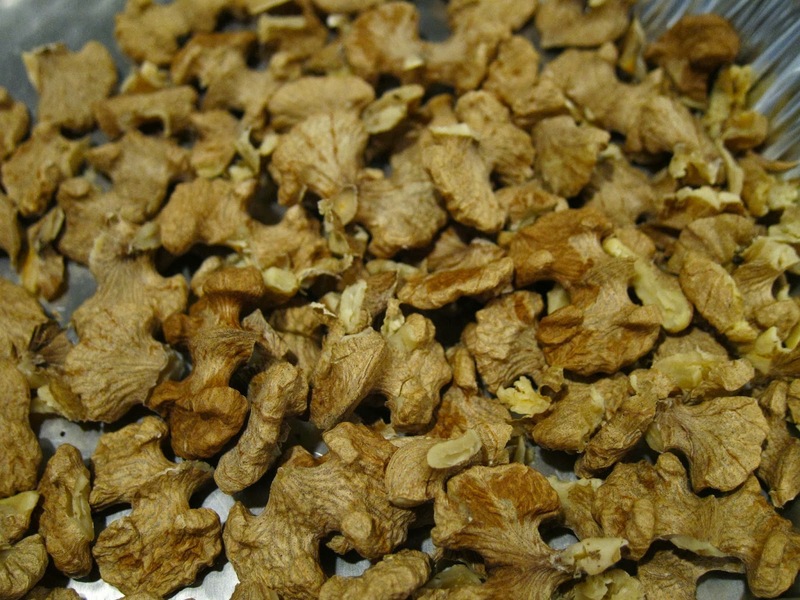 Turn off the heat and stir in the walnuts. Pour into jars and process in a boiling water bath for 5 minutes. Now I'm going to spend the rest of the day trying to pretend I don't have the dropsies. And work on getting the sugar out of the hardwood floor. As opposed to "Pi Day." While all of the eastern US is socked in with varying amounts of rain, snow and wind, I'm still prepping for Thanksgiving. Today I did the pies. I've already made the stuffing, the pumpkin bread, the cranberry sauce, and the turkey is thawing. First I made 2 pumpkin pies, just like last year except that since I didn't have any condensed milk I used extra egg nog instead (total of 1.5 cups) and I used less sugar. 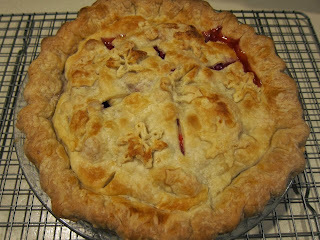 The smaller pie is in the freezer for another day. 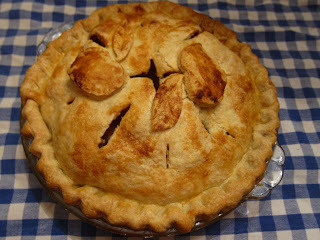 While that was baking, I made the apple pie. 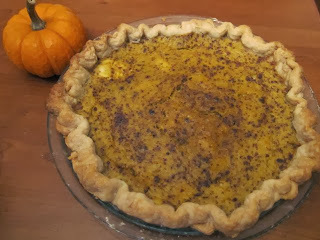 For both of them, the crust was made with half butter and half leaf lard. I think that makes the best crust so far. I forgot to put foil under the apple pie while it baked so the juices ran all over the bottom of the oven and started to burn. I had to open up a window and a door to create a cross breeze so the fan could get the smoke out. I do hate that! Not to mention that before tomorrow I'm going to have to get the rest of the burned apple syrup off the oven so I can roast the turkey in there. Regardless, I think both pies came out looking terrific! Thanksgiving is my favorite holiday to cook for, whether we have 4 or 14 at the table. I generally start preparing things a week in advance. First off, the dishes get divided up. My mother always makes the sweet potatoes. My sister in law makes the green dish and, for the second year in a row, a chess pie. I make the turkey and the stuffing, the mashed potatoes, gravy, and squash, a pumpkin pie and an apple pie, and pumpkin bread. Most of that can be made in advance which is good because I only have one oven. Today I made the cranberry sauce and canned it. It's super easy - 2 cups sugar, 2 cups water, 2 bags cranberries. Boil for 10 minutes or so. Can for 15 minutes in the canner and let it rest for 5 before taking it out. This made 3 pints of sauce. I'm not a fan of orange zest or any other flavors in my cranberry sauce so I don't get all fancy with it. Over the weekend I'll start getting everything else all set. I'm working long days in the early part of next week so the baking will have to be after dinner! I love it when I find that my past self thought ahead. Even if I forgot I did something clever. Even if it takes months to finish whatever I was thinking of. It's always such a pleasant surprise, a little gift I sent myself from the past. Today it took the form of frozen chicken. Don't laugh. It doesn't take much to make me happy. I decided it was a good day to make chicken soup so I pulled out 2 bags of frozen chicken bones and a bag of frozen vegetable scraps. Then I found a bag of what looked like cubed chicken meat. I looked all over the bag for bones and didn't see any. Could it be, I thought, that I actually managed to be prepared? That I knew that sometime in the future I was going to make chicken soup and would want to have a whole lot of meat all ready to go in? Apparently, I did. And it made my afternoon so much easier! For the stock, I tied all the vegetable scraps into a cheesecloth so I could just fish it out and throw it away. I put a bay leaf and a few peppercorns in that as well. I tossed all the chicken bones in and then added enough water to cover it all, probably several gallons, as this was the lobster pot. This simmered for a few hours. 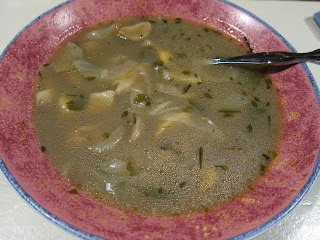 Then I took out the veggies, strained the stock, and made soup. The soup started with onion, parsnips, celery and carrots, sautéed, and then I added the chicken cubes and about 4 quarts of stock. Plus salt, pepper, thyme and parsley. Mmm. I just now added egg noodles and that's going to be dinner. While that is cooking, I'm canning the rest of the stock: 5+1/2 quarts. 4 quart jars and 3 pint jars. Which are blue. Has anyone else seen these? They're a really pretty light blue glass that I think aren't really meant for anything to go into them. After all, once you put anything yellow, or green, or red into them, it's no longer such a pretty blue color, is it? Oh, and self, here's another little gift for next time. Don't try to muscle the pressure canner closed. You know why. Over the summer and early fall I accumulated 5 gallons of tomatoes which I stored in the freezer, waiting to be sauce. I needed a whole day, or at least about 6 hours of uninterrupted time, when I could process them. Today I had that time. I brought out all 5 gallons and boiled them until they were soft. Then I ran everything through the food mill. And clogged the food mill, more than once. Very messy, but not as bad as the year when the entire thing deconstructed and landed on the dining room floor. I work in the kitchen now because the dining room has a rug. It was a good plan. Tomato juice actually squirted up to a foot from the mill through the little holes in the screen! Once the food mill step was completed, I left the juice on the stove and let it boil down until slightly less than half its volume. That's a LONG time. But I've found that if I'm not patient, my tomato sauce is watery and then it isn't as good for stews and things. Ultimately I had 8 pints of sauce. They were canned in the water bath, so each pint had a tablespoon of lemon juice added. Four of the pints are plain and four have Persian spices: lime powder, cumin and coriander. I got a fair amount of work done while this was happening. Hooray for multitasking! These were processed for 35 minutes and then they sat in the hot water for another 5. Now they're out and cooling. I haven't had tomato sauce for a few years, and it's nice to have a little in my pantry again. In other news, I started making yogurt again. I had a few failures over the summer most likely due to the milk not cooling down enough before I added my starter. This time it's perfect. At some point I might try skyr but for now this will do! Last night my husband and I went to Hank Shaw's book tour dinner at Craigie on Main in Cambridge. We had a wonderful dinner which was a tasting menu of various dishes all made with duck...something. Fish poached in duck fat, duck croquettes, duck consomme, the list went on and on. Unfortunately for me, several of the dishes had juniper* in the seasoning but the chef was very creative in coming up with something I could eat that was similar. My husband got the full experience, I was a bit envious! The food was amazing, creative, unusual; it incorporated wild mushrooms, chickweed garnishes, autumn olives - all sorts of things a forager appreciates! Hank said he wanted to show how high-brow wild and foraged foods could be and he couldn't be more right. He and the chef came up with dishes that were sublime. Meeting Hank was fun. I have to admit, I'm a fangirl. At least I didn't "squeee!" when he arrived at our table. He signed both my cookbooks (Duck, Duck, Goose and Hunt, Gather, Cook) and we chatted a bit about foraging for mushrooms and some of his recipes. I got up the courage at the end of the night to give him my blog address, written, rather appropriately, on my old fishing license that I found in my purse. So, Hank, if you're reading this, thank you for being an inspiration in the kitchen and the outdoors, for some really terrific recipes that I've enjoyed making and eating, and for making wild food accessible to so many people. It was truly a pleasure to meet you. Since I still had food left over from last weeks' share and came home with even more, I am working through the perishable food as quickly as possible. Last night we ate the lettuce, some of the arugula, radishes and peppers, plus some of the brussels sprouts. I also made that tomatillo salsa yesterday, using up the tomatillos, cilantro, and chili peppers. Today I made another batch of eggplant caponata and another batch of that hot pepper sauce. It seems today's batch was even hotter than the last. I used fewer chilis and more banana peppers, and there was one super huge jalapeño in there as well. 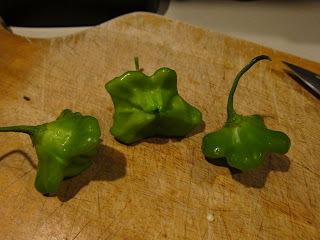 I think there was some cross pollination of the banana peppers and the habaneros at the farm, as the banana peppers were orange and red and occasionally more habanero shaped. So I guess it's fitting that both habaneros and banana peppers were used in this sauce. I also needed to clean up the garden today as it's supposed to freeze tonight. That consists of draining all the hoses and shutting off the water, emptying the rain barrel, and getting all the plants off the roof. The miniature Meyer lemon tree came inside (but far away from Mocha's constant nibbling) and the rest of the veggie plants got tossed over the side of the house. It is so satisfying to dump them off the roof! It's always a little sad to say goodbye to the farm for the winter. Today was the last pick up and I came home with lots of food. A half-peck of apples, a jar of honey, popcorn, potatoes, sweet potatoes, watermelon radishes (so pretty! ), peppers, bok choy, arugula, onions, daikon radish, celeriac, kuri squash, brussels sprouts (five STALKS), tomatillos, hot peppers, cilantro, parsley, sage, and lettuce. My sister-in-law took the cabbage, butternut squash, and garlic in addition to her half of the other things. We decided I would keep all the tomatillos and hot peppers to make more salsa verde and more of that hot pepper sauce and then just give her half. I tackled the salsa verde first. By combining the tomatillos I had last week with today's I had 3 pounds which allowed me to scale the recipe up for a change. I ended up with 3 pints of salsa; 2 jars will go to Steph and I'll keep one. For dinner we had pan seared salmon (cooked over sautéed cabbage, allowing me to use up another head of cabbage, I have 3 left), plus brussels sprouts, and a nice salad with the lettuce, arugula, bell pepper, watermelon radish, and dried cranberries. Thanks to everyone over at the Food Project for another great year! See you in June! Last week at the stables I saw shaggy mane mushrooms. Nothing else looks like them. Many had already turned inky with age, so I was certain they were correct. All week I debated if I should try again with the wild mushrooms. My last 2 attempts both resulted in tingly lips and I felt like that was the end of it. But still I wondered, especially if I could eat wild mushrooms in restaurants. I decided to go for it. 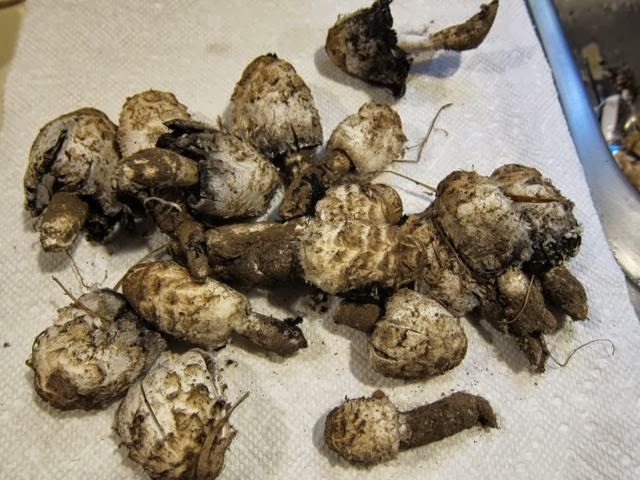 Yesterday I was at the stables and picked a bunch of small shaggy manes - I tried to get the smallest, youngest ones I could because they don't last long and I wanted to test one out ahead of time before I used them in something. 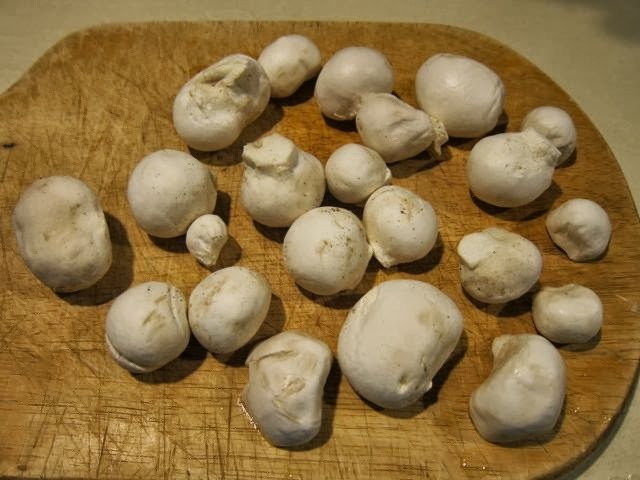 While I was wandering around the back field I found a bunch of other mushrooms: alcohol inky caps, which I did not pick, and gem studded puffballs, which I did. Last night I tested the shaggy mane by boiling it and eating a few pieces. No tingling. This morning I peeled and sautéed one of the puffballs and sampled it. Also no tingling. 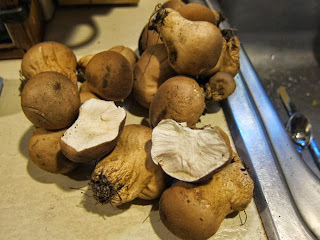 Encouraged, I thought about making a meatless stroganoff with the two mushrooms together. After getting the whole thing to a simmer, my husband scoffed at it and said, "It is nothing like stroganoff. Why don't you just call it soup?" Soup it is. Sauté the onions and the puffball mushrooms in butter, add flour and continue to cook for a minute. Add the stock and bring to a boil, stirring occasionally, until thickened. Add the shaggy manes and spices, simmer. Today I tackled all those peppers. I had about 3 pounds of green and red bell peppers and 5 poblanos, mostly from the farm but a few were from my roof garden. I didn't want to make a relish again, so I decided I might try roasting and pickling them. The roasting part is easy enough, but the peeling and slicing is rather messy. I kept the red, green and poblanos in separate bowls in an attempt to make nice layered arrangements with the red and green peppers. The poblanos fit into a half-pint jar with some of the onions and garlic from the brine. I tried to get all the others into my remaining 3 half-pint jars, and that just didn't work. I had to switch to pint jars and I ended up with 2 pints of somewhat jumbled red and green peppers. Oh, well! This was from the Ball Complete Book of Home Preserving, page 317. Props go to my brother-in-law who procured a recipe for me for hot banana pepper sauce. He gave it to me a few years ago with a jar of said sauce, which was hot and thick and wonderful on meats. 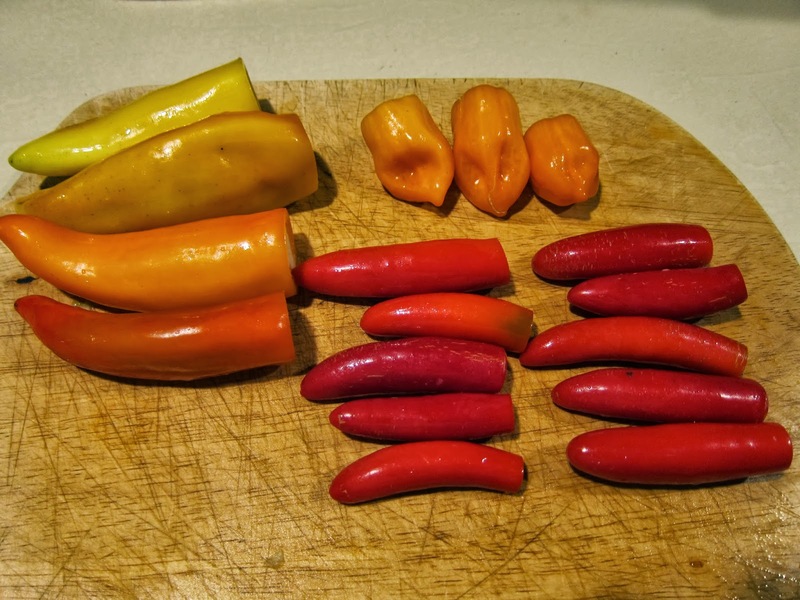 Yesterday in the farm share I got to pick a whole quart of hot peppers and, when I saw there were banana peppers, got to thinking about this recipe. However, since I didn't have the 36-50 peppers the recipe called for or, for that matter, enough mustard (it calls for a quart! ), I scaled a bit, and changed a few things. 4 banana peppers, 3 habaneros and 10 chilis. Yum. I also made a cranberry habanero chutney using this recipe. I doubled the recipe and in the place of the habanero jelly I added 4 minced habaneros (seeds removed) and in place of the jalapeños I added 1 green bell pepper. This made 7 cups of chutney, a good addition to my gift stash. I am planning on doing more today but now I'm tired and all my pots need washing, so I think I'm going to rest a bit and see how I feel. I have to work until 2 am tonight so I might want to conserve my energy! 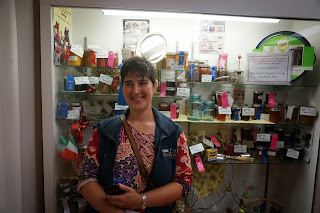 When I dropped my canning entries off at the fair, I met a fellow canner, Roxanne. She was entering tons of unusually flavored things: gingerbread jam, limoncello jam, and an eggplant caponata, just to name a few. I got to talking with her about it because I'd been looking for a way to can eggplant and she very generously shared her recipe. Well, her caponata won first place in its division and seeing that inspired me to try to make it. I won't reprint the recipe here, since it's not mine, but it has tomatoes, eggplant, olives, celery, onion, and capers in it. I added green bell pepper since I have a lot of those, too. It made 7 cups and a little bit. 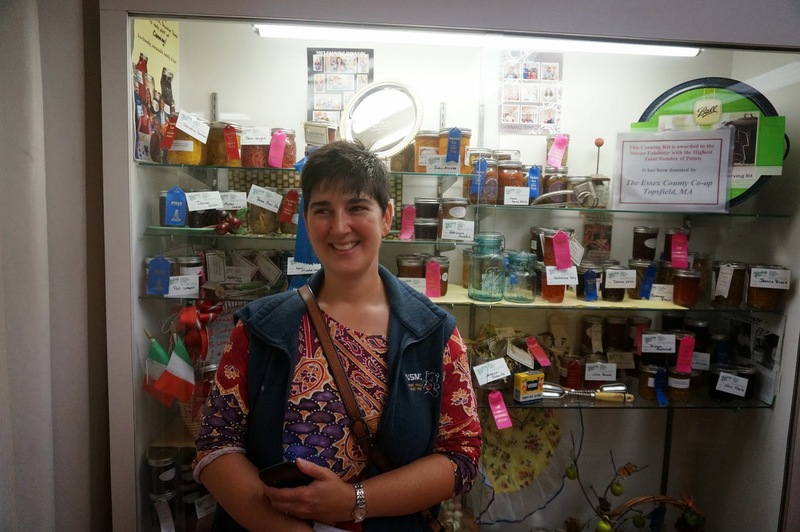 Congratulations to Roxanne, and that wasn't the only ribbon I saw with her name on it! First I made a pie crust for a single-crust pie, tossed my pie weights in and baked it for about 20 minutes at 400 degrees. While that was baking, I sautéed the leeks in a little oil, then added the arugula and stirred it until the arugula was wilted. I took it off the heat, added the vinegar and the bresaola and tossed. In a bowl I beat the eggs, added the half and half, cheese, and spices. When the pie crust was ready, I put the leek-arugula-bresaola mixture in and poured the egg mixture over the top. This was baked at 375 degrees for 35 minutes and it was terrific! Yesterday's farm share was full of lovely autumn things: a sugar pumpkin, an acorn squash, tomatoes, parsnips, turnips, beets, arugula, peppers, potatoes, garlic, tomatillos, hot peppers, green beans, parsley, cilantro, and a few things I didn't even pick up (bok choy, flowers, eggplant, mustard greens, and so on). I'm getting behind on my canning projects so took a few minutes this morning to make that tomatillo salsa again, but since I used a green chili pepper I can officially call it salsa verde. Since I only had a pound of tomatillos I cut the recipe in half and now have 2.5 cups of salsa in the canner. I used the immersion blender to make it smooth after it simmered for 10 minutes. Still in the works: I have about 5 gallons of tomatoes frozen, waiting to be sauce. I have slightly less than a peck of apples in the fridge, also waiting to be sauce. I think I have enough beets to make a batch of pickled beets. I still haven't heard from the farm where I get my Elberta peaches and I'm beginning to think I won't. That's OK. At some point I'll roast that pumpkin and save it for pie. I have eggplants and peppers and greens from my mason and I have peppers from my own plants to harvest and do something with. What I'm lacking right now is time. There are 3 more weeks in the share, and hopefully then I'll finally catch up! This has been a busy week for baking things. First we had to celebrate the one-year-anniversary of getting Mocha, our rabbit. He got a carrot. We got carrot cake. Brasilian Carrot Cake, to be exact. Here's the recipe, so I'll have it digitally in addition to on a little scrap of paper. Blend the carrots, oil and eggs in a blender until smooth. Mix in the rest of the ingredients and pour into a greased 9x13 pan. Bake at 350 for 35 minutes or so until done. Poke holes in the cake with a fork. 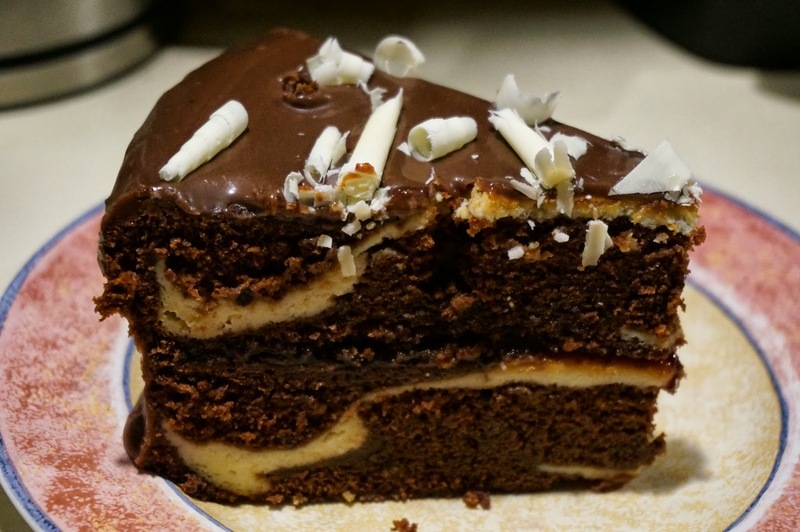 Cook this together for a few minutes and then pour over the cake while it is cooling. The glaze should ooze into the holes you made with the fork. We ate the cake while he sat on his chair and stared at us. I think he was feeling rather full from his carrot. Then, 2 nights later, the 11 year old had a birthday party. 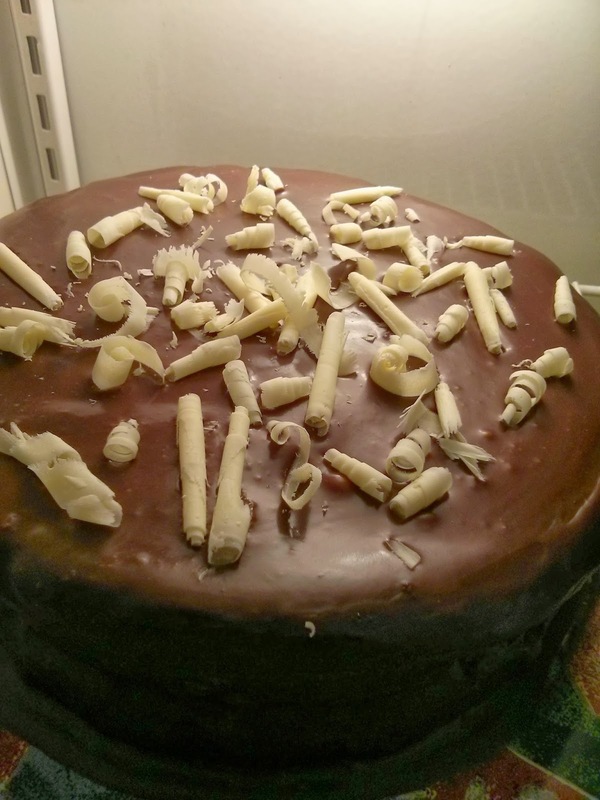 I take requests, of course, and this one was a chocolate cake with raspberry filling and milk chocolate ganache. Voila! By the time 14 people (2 adults and 12 children) got to it, this is all that was left. No baking today. We went to the Edward Gorey Museum in Yarmouthport, MA. The rest of the afternoon was spent elaborating upon the Gashleycrumb Tinies. Until my bike started having issues I was having a nice bike ride today on the path. I passed the hops and autumn olives and rode on, past the nettles and the crabapples and some grapes. Then my bike lost a small but apparently somewhat important screw and I had to go home. Fortunately, the bike was ridable but I couldn't risk going further in case it suddenly wasn't. On the way back, I stopped at the nettle patch and grabbed a bag full. I'd planned ahead, with gardening gloves and scissors, but I still got stung on my wrist above the glove because the patch was pretty dense. 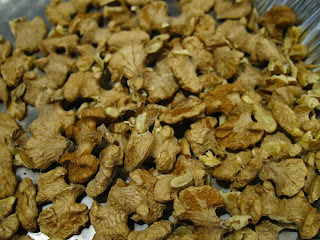 Then I rode on and stopped again at the black walnut tree and picked up a few more walnuts. All told, I biked 12 miles. While the new walnuts were drying, I cracked the other batch with a vise, pulled out the nutmeats and roasted them for 30 minutes at 200 degrees. These are in the fridge in a little jar, and maybe I'll add them to my oatmeal. Then I set to work making something with those nettles. First I blanched them and left them in a strainer while I made a sauce. Whisk the milk and mascarpone together. Saute the garlic and shallot in 1 T. butter and 1 T. olive oil about a minute or two, until soft. Add the nettles and the milk/cheese mixture and mix. Let this boil and thicken for a minute or two. Add salt and pepper to taste, and a pinch of nutmeg. Add the parmesan. 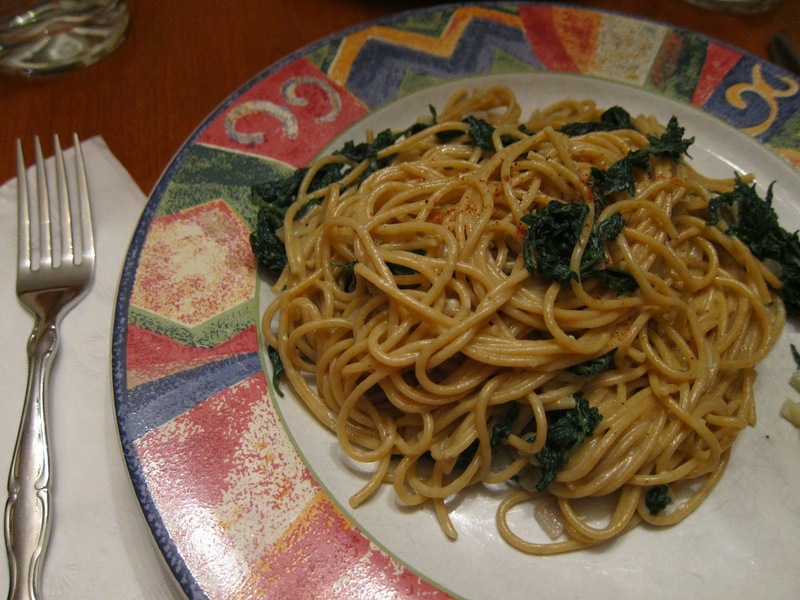 Toss with pasta, serve with a little extra nutmeg on top. I tossed thin spaghetti with the sauce and served with extra parmesan cheese. Yum. 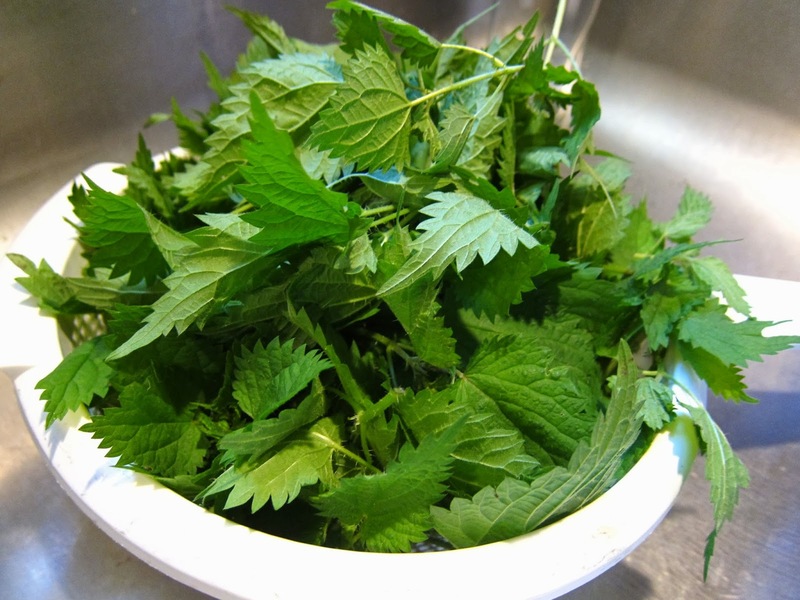 I think this might be my favorite form of nettles yet! OK, now I'm just being silly. Even so, every Wednesday I walk around the stables and look for foragable things. Like autumn olives, and grapes. Yesterday I discovered that the crabapple tree had actual crabapples, not the stunted little rocks it usually has. I tasted one and it was pretty good even though it was a little sour. I hit upon a plan (uh oh, we know how these things go....). I combined the autumn olives (1 cup), wild grapes (1 quart) and crabapples (1 quart) in a pot and covered them with 5 cups of water. This was simmered and crushed and strained through a jelly bag last night. I got a little over 4 cups of pink, syrupy juice. This morning I added 1.5 cups of sugar and another pint of water and made juice for canning. Using the instructions for grape juice, I heated the juice to 190 degrees for 5 minutes and then put it into pint jars (3) and now will process for 15 minutes. I'm trying to come up with a good name for it. "Crabby Autumn Grape Juice" is so far the best contender. There's a nice little orchard/farm not far from the stables and every Wednesday after riding we stop and get peaches. Sometimes we get other fruit, like plums or apples, and lately they have had really good, tiny Bartlett pears. Yesterday there was a quart of them that were perfectly ripe, so I bought them and quickly realized I needed to use up about 6 of them in the next day. I decided to poach the pears. Boil the water, sugar and ginger for 5 minutes to make a light syrup. Add the pears and simmer for 10 minutes. Remove the pears, add the molasses and boil again, reducing the volume of the syrup until it's as thick as you like. Pour over the pears. Voila! I don't want to use up all the honey-crisps for cooking, since they're such good eating apples, but I did want to make a batch of chunky applesauce. So I used 9 honey-crisps and the last 3 Cortlands and made some. The apples were peeled, chopped into about a 1/2 to 3/4 inch dice and mixed with 1 cup white sugar, 1 cup water, some cinnamon and a dash of nutmeg and then cooked until soft but not disintegrating. This made exactly 2 quarts, which is now in the canner (20 minutes, then rest for 5 minutes before removing). One of these days I'll work on all those tomatoes. 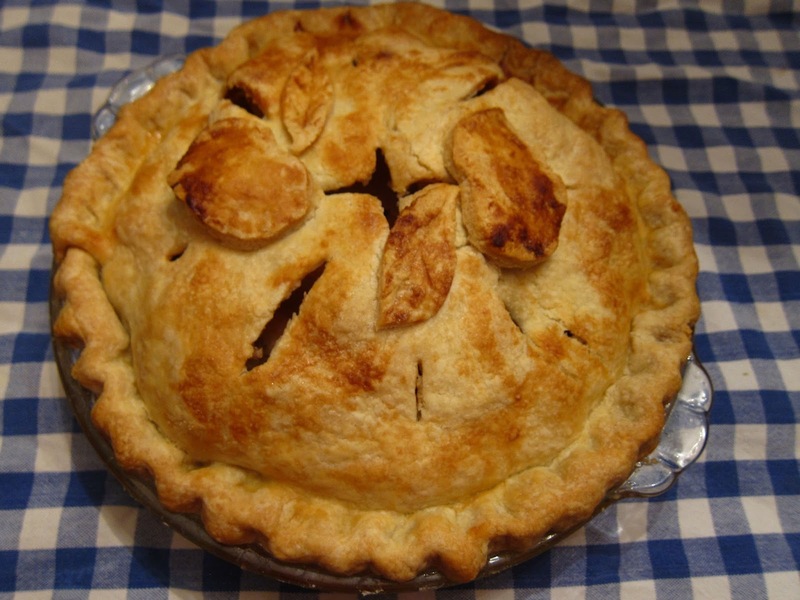 Having made apple bread/cake and applesauce so far with the apples, it was time to make a pie! Today's crust was half leaf lard and half butter. I've made a lot of apple pies and I think it might just have been The. Best. Ever. 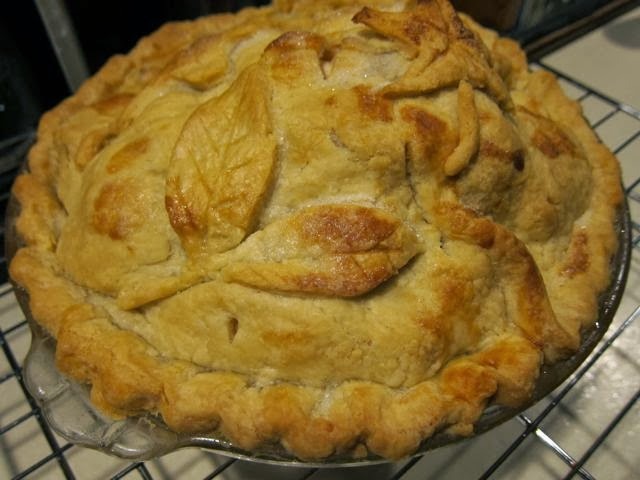 I also baked it a touch longer and that seemed to help as the apples were so soft they were almost sauce. Almost. But certainly not crunchy or tough. So: 15 minutes covered at 450 and then 20 minutes covered at 375, then 40 minutes uncovered at 375. We always try to go apple picking every fall. Last year we went while we were camping, so not to our usual place. This year we returned to our usual haunt, and tried to get there early enough to make it enjoyable. It claimed it opened at 10 am, but we got there at 9:55 and the place was already full of cars. However, the apples were plentiful and we filled almost the whole half-bushel with honey-crisps. In the past we've been limited to 8 or 10 honey-crisps. It took less than 20 minutes to fill our bag. Once the apples were safely stashed in the car, we had cider donuts, ran in the hay bale maze, oohed and ahhed at the bunnies, and went home. Once we got home I made a double batch of apple cake but put it in 4 loaf pans and now I have 3 loaves of apple bread in the freezer and one for tonight. Then I made a tabouli salad from the farm share tomatoes, parsley, and scallions. Then I made a batch of applesauce from the honey-crisps: 12 apples, 1 cup water and then, after everything went through the food mill, I added 3/4 cup honey. So now it's honeyed honey-crisp applesauce. Mmm. Then we made caramel apples (and pear, for the apple-allergic) and devoured them. Good thing we only do that once a year! Well, the canning entries are submitted! 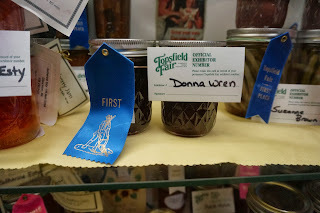 Ultimately, I entered 5 classes: Raspberry Jam, Other Jam (Lime Black Raspberry), Grape Jelly (not Concord), Other Jelly (Rose Hip), and the selection of 3 jams (Triple Berry, Wild Blueberry, Wild Blackberry). While I was there I met some very nice people also dropping off their entries. One woman gave me her recipe for eggplant caponata which looks like a great way to use eggplant. I have no idea when I'll find out the results, but wish me luck! Tonight I'm working the overnight and I need to be taking a nap. But I figured I had some canning to do, so maybe I should tire myself out first? The peck of apples made 4.5 quarts of applesauce - smooth with white sugar (note to self: 2.5 cups for the whole peck) which will make the 8 year old very happy. We opened our last jar a week or so ago. The food mill didn't give me any trouble today, either, which is nice. I also roasted those poblano peppers. Unfortunately a few went bad in the fridge so I didn't have as many as I planned. But I had about 7 smallish peppers, and 2 red jalapeños, so I roasted those too. After taking off the skins, I stuffed each poblano pepper with shredded "Mexican mix" cheese and topped them with a little more. The jalapeños went on the edges of the dish. I'll bake them for dinner; they'll make a nice little side dish. This week the entire farm share came to me - which is rather daunting. I now have: 2 pounds beets, 1 pound carrots, 1 pound peppers, 1 pound + 1 quart tomatoes, 3 garlic heads, 1/2 pound of shallots, a bunch of huge scallions, 1 bowl of arugula, 1 bowl of mixed greens, 2 pounds eggplant, 3 delicata squashes, 1 peck of apples, 1 head of cabbage (add that to the 2 I already had at home), a quart of tomatillos, a pint of hot peppers, parsley, and a handful of cilantro and a few raspberries. I didn't even try to get the blackberries, husk cherries, or flowers. That was enough! In addition to cabbage at home I still had beets, peppers and poblano peppers from last week. There were 3 tomatillos in my kitchen from last week and when I added them to the quart from today it was just enough to make a batch of Tomatillo Salsa. I used garlic, cilantro and hot peppers from the farm share, although I used red jalapeños rather than green chiles. So it isn't really a salsa verde, it's more Navidad, perhaps? I also did not have enough plain cumin, so I used what I had and added a little of the cardi (coriander and cumin mix). Still, it made just over 4 cups which are in 3 jars: 2 half-pints and one pint. I have a plan to make more tabouli salad tomorrow, to use the scallions, parsley and some of the tomatoes. If I don't use up all the tomatoes I'll freeze them in my collection for sauce. Someday I'll have time. The apples will get made into applesauce soon as well. I also have a collection of poblano peppers that I hope to roast a little and maybe stuff with cheese or something. I'll figure something out. 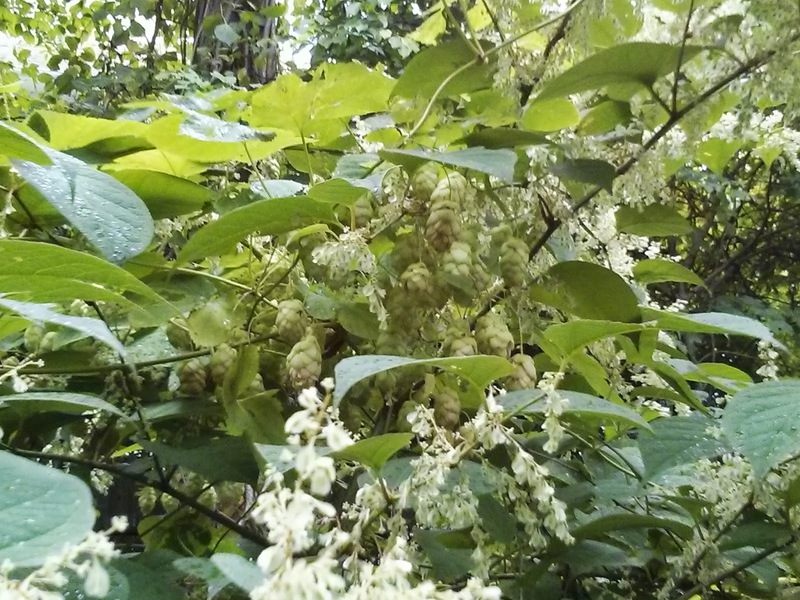 After receiving a tip from a friend, I went looking on a bike path for wild hops. We thought it might be fun to make beer with them and see what happens. We went for a ride and I found nothing, but I did see grapes, and nettles, and crabapples (the grapes and crabapples were rather tasty). So I went back on foot, thinking I must have just been going too fast. 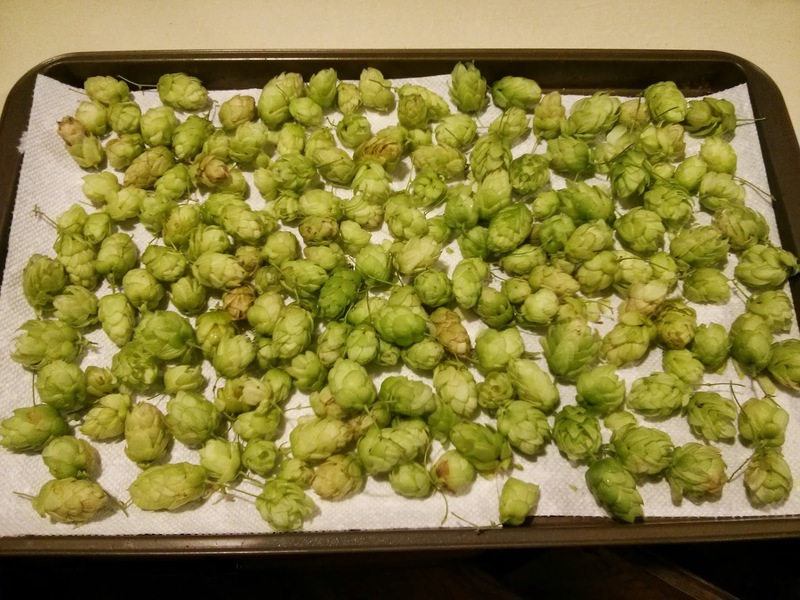 Turns out that was the case, and I found all sorts of wild hops. I gathered about a quart, maybe more, and at home the total weight was 97g. Then I dried them in the oven for a while and reweighed them: 27g. While I was out on the path, however, I found autumn olives and black walnuts. I am not sure if I'm going to go crazy over the autumn olives this year, but this shrub was plentiful, so maybe I'll go back for them. I also snagged 28 black walnuts off the tree, so before they fell and got all nasty. They've been husked by me driving over them with the car (there were 30 nuts, but 2 got crushed by the car) and are now drying for a few weeks. Then I'll crack them open and see what I get. Last year I was disappointed that the nutmeats were dried out so I am hoping that by getting them directly off the tree that won't be the case. 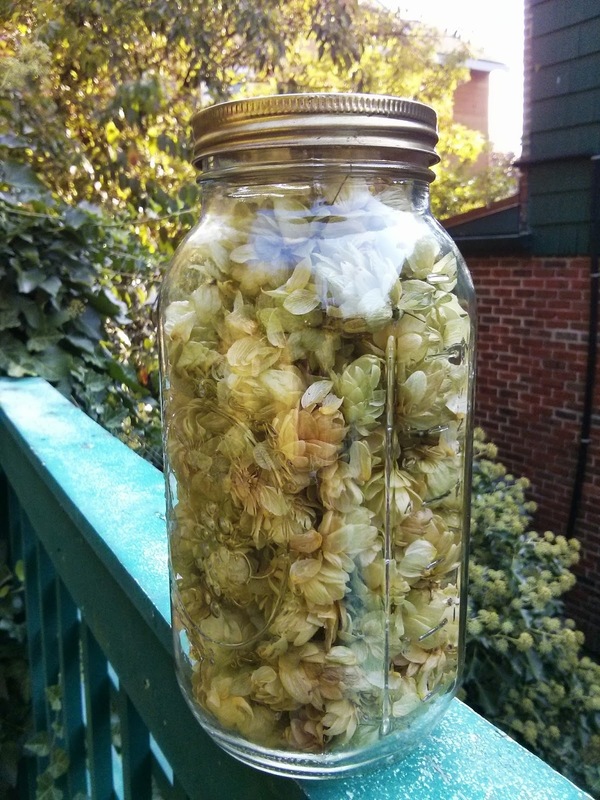 I checked with another homebrewing neighbor and now have a plan for these hops - we'll add them for aroma at the end of the fermentation cycle. They smelled wonderful while they were drying in the oven! It's a really beautiful day: sunny, not that hot, and not a cloud in the sky. The kids are back in school and it's raspberry time! I went out to the farm today and picked almost 4 quarts of berries. It was just under 4 pounds! I had to make two trips to fill my bag of quart boxes so I could be sure I had enough. While it wasn't as bad as last year with regard to the infestation problem, it still wasn't that relaxing as it was crowded and somewhat noisy. Oh, well. Not everyone goes there to think, I guess. I brought the berries home and ran most of them through the food mill (I think I have a pint left). Once I got the 5 cups of puree, I made a batch of jam with the powdered pectin. As I only had 2 half-pint jars left and I want to enter this jam in the fair, I made sure they were as perfect as I could get them - no foam or bubbles! The rest went into 4 pint jars and they were all processed for 10 minutes. 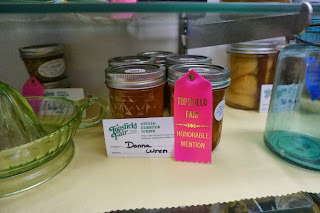 I am done with all the things I planned to make to enter in the fair so now I'll be moving on to apples, peaches and tomatoes when I am ready. A few days ago my friend brought over almost 5 pounds of grapes she found growing wild in her yard. This is the same yard with the violets and a menagerie of wild animals: groundhogs, herons, hawks, mice, frogs and turtles, deer, and likely a fox or a coyote for good measure. She has spent all year watching what grows and trying to identify it and the grapes were a surprise find. I froze them until today since I didn't want them to go bad while I was finding the time to make jelly. Today I brought them all out, added 2 cups of water, and simmered and crushed and simmered again. Then I ran them through a jelly bag and got a little over 4 cups of juice. I added enough water to get 5 cups, and then I made jelly with powdered pectin and 7 cups of sugar. This made 9 cups of jelly and a little extra for tasting. It's a little tart, just sweet enough, and a nice reddish purple color. 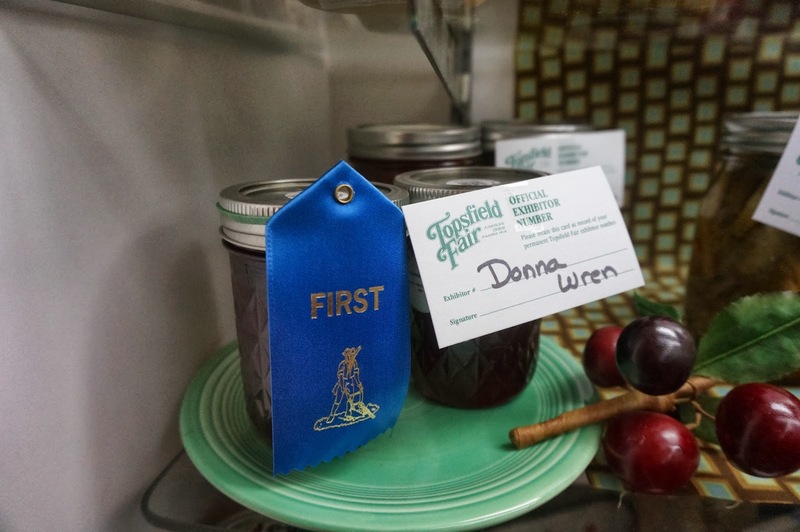 This is another one I plan to enter in the fair, under the "Other Grape Jelly" category since I am quite sure they're not Concord grapes. In yesterday's farm share there were red carrots. At first glance, they didn't look all that red, but when I got them home and compared them to regular carrots then it was obvious. Pinky red. There were a lot of them, part of the 6 pounds of mix and match that Stephanie and I split. I brought home 2 pounds of very petite carrots, thinking I could pickle them whole. Today that's just what I did. I'd grabbed dill flowers while I was at the farm, enough for 6 jars of carrots. Using the Dilled Carrots recipe from The Ball Complete Book of Home Preserving I made a full batch of brine because I thought I would get 4 or 5 jars. After scraping all the carrots they were so skinny I only got 3 jars. There are a few orange carrots mixed in which only serve to make the rest stand out. So pretty! The farm from which I get my CSA share has been struck with a late blight. This is a little different from previous years, in which the blight was early and there were almost no tomatoes at all. This year we have gotten a lot of tomatoes already but this week, with the blight present, the staff picked every tomato they could. This week's share was 8 pounds of tomatoes plus a quart of "Defiant" tomatoes (so named because they are blight-resistant). It seems that every year the farm is vulnerable to something, whether it is blight, or a hurricane, or an early frost, or searing heat in the summer. I find it fascinating to watch how the plants respond and also to see how the staff balance what they plant every year in anticipation of what might happen. It's good that the farm has such a variety of crops. But it is interesting to think about the food chain and how it all fits together. Bishop's Crown Peppers. Aren't they cute? I came home with 4 pounds of tomatoes plus a pint of Defiants, onions, hot peppers, cabbage, broccoli, mixed greens, carrots, pattypan squashes, garlic, beets, parsley, blackberries, dill flowers, and a large bouquet of cut flowers. Recently my husband had noted that salsa was one of the few things we ate out of a jar that was store-bought. I decided I'd better change that! I used the same salsa recipe as the last time I made it 2 years ago but used the immersion blender to make it smoother. Partly because I'm still working through a collection of oddly shaped peppers from my mason's garden. He brought me banana peppers, long skinny green peppers that looked like they should be hot but weren't, and Bishop's Crown peppers. Those last ones are the weirdest peppers I think I've ever seen! So, ultimately, this batch consists of: 5 pounds of tomatoes, 3 onions, lots of little peppers, 1 habanero, 1 jalapeño and 2 other chili peppers, and 2 cloves of garlic. It made 6 pints. Tomorrow I plan to make dilled carrots and then sometime soon I'll make grape jelly with grapes from my friend's yard - she brought me 4.5 pounds today and they're in the freezer. That's what my rose hip jelly looks like. Sunshine. See? It tastes better than I remember the previous batch tasting and I'm quite happy with it. Yesterday I enrolled online for the fair. So far, I've entered 3 classes: Other Jelly (for this one), Raspberry Jam (for the Lime-Black Raspberry, but if I make regular raspberry I'll swap out with that one) and an assortment class of 3 jams, all different. I plan to use the Lime-Black Raspberry, Triple Berry, and Seedless Blackberry. If I make the red raspberry in time, I will enter the Lime-Black Raspberry in the Other Jam category instead. I have to have my submissions in on September 14. That doesn't give me much time! Today we returned from our annual camping trip and, this time, I was armed with a very handy book! It was a gift from Lisa, and I used it to identify some berries I didn't really recognize. When we arrived and found our campsite was full of blackberries, I hit upon an idea. 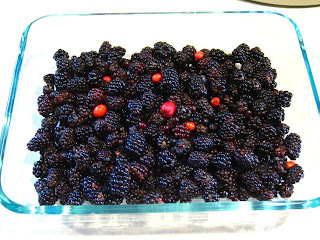 I would collect every type of edible berry I could find and make a crisp or cobbler out of them when we got home. Mostly I found blackberries. Wild, small, tart blackberries. I also found similar berries on a ground cover bramble - a different type of blackberry, it seems. And I found Juneberries, blueberries, huckleberries, elderberries, partridge berries, and a single teaberry. (It's a little early in the season for the teaberries (aka wintergreen), after all.) 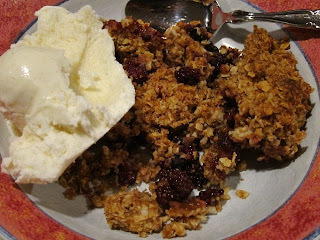 I also ate a couple of bunchberries but, like the partridge berries, they were tasteless so I decided to leave them out of the final baking. Once I got everything home I washed and sorted and got rid of any that had gotten squishy over the weekend. Then I put them in a little 7 x 4 pyrex dish and made a wee little crisp. It was pretty seedy but tasty! As I think I've previously mentioned, this has been an excellent year for berries in our area. Everywhere I go, I find some sort of berry or other. So far it's been blueberries, elderberries, and blackberries, with a few raspberries thrown in for good measure. It is much more fun to go on a walk when one can stop and eat a few berries! However I have also wanted to make blackberry jam. But I never get enough at one place to make that possible. So I have been going on lots of walks, carrying ziploc bags or little berry baskets, and getting a few here, a few there. I have lots of blackberry areas staked out, and would give more berries time to ripen and go back. It's paid off; I accumulated and froze 2 quarts of berries and, yesterday, got about 1 cup more. Time to make jam. I pulled out the food mill this morning and ran everything through. The yield was 5 cups of seedless blackberry puree, just enough for a batch of jam with the powdered pectin. Somehow it made 9 cups of jam, which was a surprise, as the recipe indicated I'd only get 7. Whatever! The 8 year old, who helped get a lot of the berries, got to lick the pot for breakfast. How great is that? 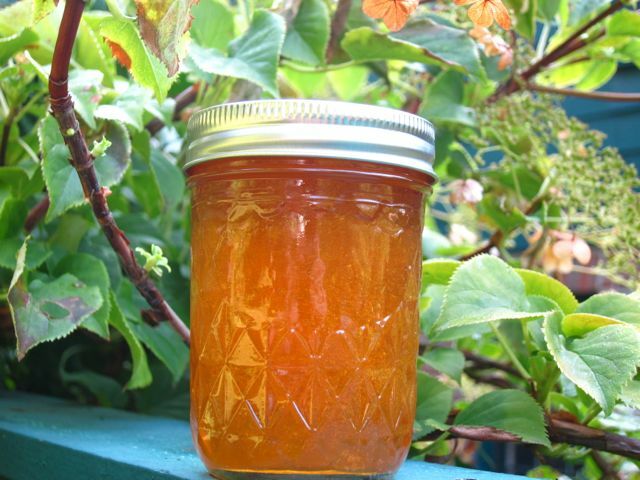 Two foraged canning projects in one day! Crazy! Last year, I finally discovered what elderberries look like. It took a while to be sure I had correctly identified them. I had just a few and made a single jar of jam. This year, everywhere I look I find elderberry bushes. I'd found some at the stables, but surrounded by thorny rosebushes. There's one at the park down the road. None of those berries were ripe yet, so I decided to stop by a few other parks with streams I knew of. I found some in a nearby town today along with a bunch of blackberries. 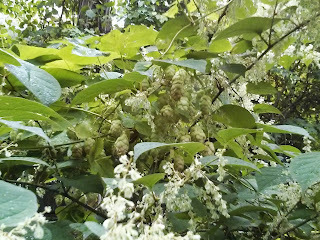 I picked a few, as there weren't a lot of ripe panicles, and thought I'd come back in a few days or so to check again. I left the park. I walked across the street, to where the stream came back out and alongside an access road to yet another park. It was there I found the motherlode of elderberries! These ones were huge (in comparison, let's face it, they're still only about a quarter of an inch across), and the panicles were laden with berries. Much more than any I'd ever seen. I picked a whole lot, and got them home to discover I had about 6.5 cups (some weren't too ripe, I saved those for the photo). I wanted 8 cups to make a batch of jam, so I went back out to yet another conservation land and, sure enough, found some more. Enough to make 8 cups. To make the jam, I boiled the berries with 3/4 cup water for a few minutes then crushed them with a masher. I should have taken the seeds out at this point, but didn't. Now I know. Next year, no seeds! Anyhow, to this I added a package of powdered pectin and 7 cups of sugar and now have 10 jars of elderberry jam, plus more in the fridge. I've had a few spoonfuls, just to make sure I was correct in my identification, before I feed it to anyone else. 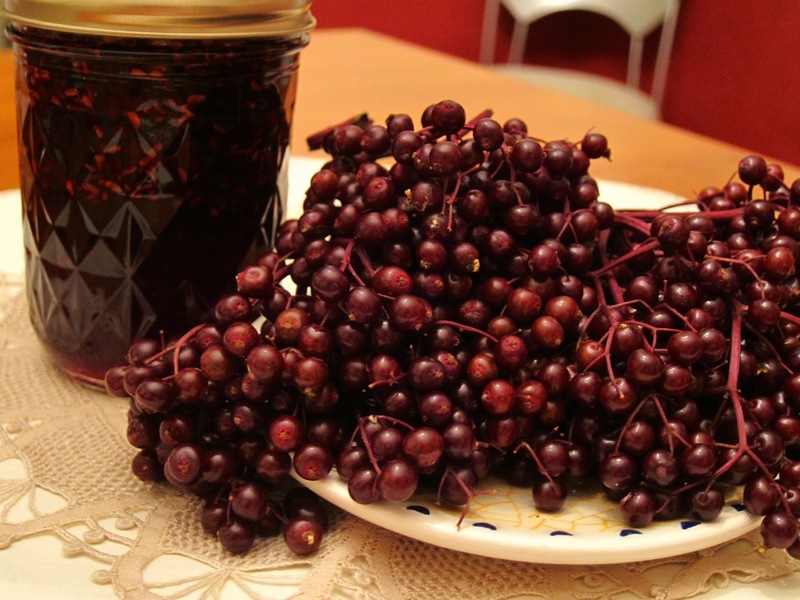 If I feel inspired to pick any more berries, I might make elderberry syrup. The cheeses I made back in April arrived in the mail today. I wasn't really sure how that was going to work out, it being summer and, while not as hot as a few weeks ago, still pretty warm for cheese. They arrived in a little box without any particular insulation and they were fine. Go figure. I guess cheese is fairly hardy stuff! The cheese on the right is the cow's milk cheddar and the one on the left is the sheep's milk reblochon. Both were aged for a while longer than planned, more like 100 days rather than 60. The texture wasn't what I was expecting but they both tasted good and you could tell the difference between the two. The cheddar was sharper but still had a creamy texture. The sheep milk one smelled, well, more sheepy. We had a lovely dinner of bread, cheese, pate and charcuterie, grapes, cherries and chocolate. It's the first batch of soup in ages, and one of the jars broke in the canner! I really hate it when that happens, it's such a mess to clean up. But I still have 13 pints of beef and barley soup anyway. I made it basically like the last batch but left out the wine and the tomato paste (and the last minute veggies) and used extra celery and carrots (the carrots, at least, are from the farm share). I also had leftover "Slow Cooker Osso Buco" in the freezer to add, so that replaced the tomato paste. The other part that was different was that I didn't really cook the barley before I put it in the jars, since that way the barley would cook up but not thicken up the soup as much as previous batches. This was processed in the pressure canner for 75 minutes at 10 pounds of pressure. I am pretty sure I heard the jar break at the beginning of the processing time. At that point, there is just nothing to do but wait until it's all done and deal with the mess. The freezers are progressively getting emptier. Which is a good thing. I've been slowly working on this for a while because we've been having technical difficulties with our ice maker and so have had to defrost the kitchen freezer once already. I discovered all sorts of things hiding in there so made a plan to start using up what I have. Then I can start fresh when things go on sale and I'll have space to put it all! Two weeks ago we started a batch of beer. We're still new at this, so we used a kit, but it was of "intermediate difficulty," which meant we had to steep the grains ourselves. Once we had the batch made it sat in the basement near the boiler and did its thing. Last week we transferred it to the 5 gallon carboy, the second rack, and let it sit again. Last night we felt it was ready to bottle. Since it's only been a year and a half since the last batch, not 10+ years, it went more smoothly. There was far less mess than the last time and no one got doused in beer. Everything was sanitized, the priming sugar was dissolved in boiling water and put in the big bucket, and then the beer was siphoned into that. It tastes like flat beer, like it should, but I have no idea what the alcohol content is because, apparently, I cannot read a hydrometer. My first pass at calculations led to a result of 0.78% alcohol, which can't possibly be right. The second pass at it yielded 13%, which also can't be right. I gave up at that point and figured that as long as it tasted good it was ready. At first we filled the larger bottles - we have 12 32-ounce bottles with the snap-on caps (like the ones for glass jars with the rubber gaskets) so that held most of the batch. Then we filled regular beer bottles with the rest and capped them with standard bottle caps. There's 9 and a half bottles of that size. Given how quickly the beer fermented in the first place, they might be ready to drink in a week. Today I finished up all those wild blueberries by making blueberry sauce. But I just do not understand how 7 cups of berries + almost 4 cups of liquids + over a cup of sugar = 6 cups sauce. I mean, I get that things cook down and all, but that seems like an awful lot. Doesn't it? Anyway, the recipe is in the Ball Complete Book of Home Preserving and it uses 1 lemon (zest and juice) and 7 cups of berries. The rest is apple juice, sugar and corn syrup. We'll be trying this very soon. Maybe on some pound cake or something. The kids were vacationing with their grandparents and returned the other night, bearing gifts: maple syrup, a freshly laid egg, and 10 cups of wild blueberries! Spread the berries in a 9 x 13 baking pan. Cream the butter and the sugar, add the milk and mix until smooth. Add the flour and the baking powder, mix and spread the batter over the berries. Then mix the 1 cup of sugar and the cornstarch, sprinkle over the top of the batter, then pour the boiling water all over everything. Bake at 350 for an hour. Perfection! Today I took the 6 cups I'd frozen to make the jam and did that, using the recipe for powdered pectin - 6 cups berries, crushed, pectin and 4 cups of sugar. It made a total of 7 cups and I couldn't help but lick the pot afterwards! So so so good! Even the ornery 8 year old, who didn't want to like it, liked it. 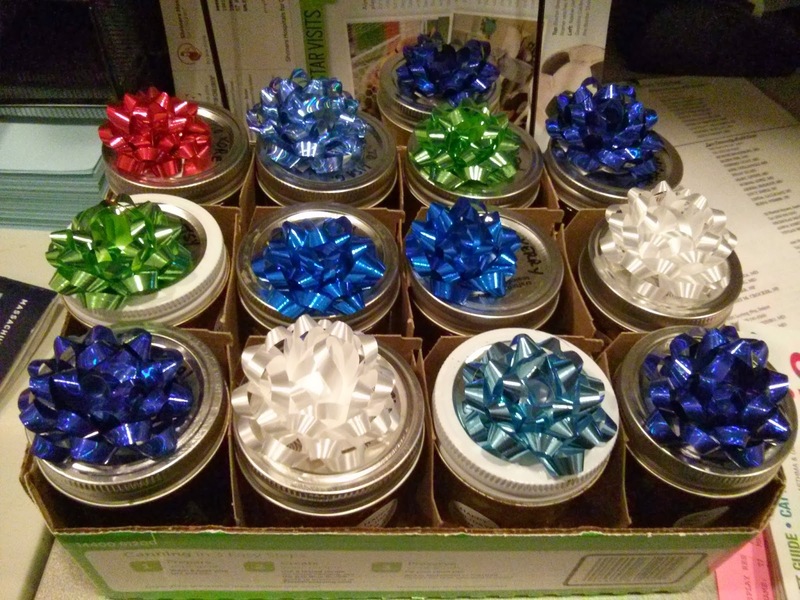 Six of the jars are the half-pints and 2 are half-cup jars, to add to the gift stash. Lastly, at the request of the 11 year old, I will be making blueberry sauce. Apparently the farm at which they were staying makes it and it seems as good a use as any! It sounds like it's a little like a blueberry syrup so that would have plenty of uses in our house! Once the brine is boiled (vinegar, water, salt and garlic) then each hot quart jar is filled with 8 garlic halves, 6 peppercorns, 4 T. dill seeds and sliced cucumbers and filled with the brine, leaving half an inch of headspace. Then they are processed for 10 minutes and I leave them in, off the heat, for 5 minutes after so they don't siphon or anything. Most of my cucumbers were too long but 3 or 4 of my jars have smaller, whole cucumbers mixed in with the slices. I also made a point of cutting off the blossom ends from the slices since I read somewhere that they can get mushy if you leave them on. The finally tally for a peck of cucumbers: 15 pints of bread and butter pickles and 7 quarts of dills. Plus 6 for eating. I think we're set for a while, on pickles, anyway! My work schedule over this weekend has been very, very strange. I worked until 8 pm on Friday and until 2 am last night (but didn't really leave until 2:30, just finishing up a few things) and tonight I'm doing an overnight. So I slept until 10:30 am, and then my husband and I spent all day working around the house: cleaning, painting, and canning. Oh, and laundry. There's always laundry! 2 nights ago we transferred the beer to the big glass carboy for its second rack. Likely it'll be ready to be bottled by next weekend. And I added the wine to the sauerkraut and it's in its crock with the waterseal and I'll leave it for a week and then check it. I am trying to carve out time to finish that peck of cucumbers so I hastily made another batch of the same bread and butter pickles I made the other day. I am now out of turmeric, sugar, and mustard seed. I guess I have to get to the store! Oh, and I still have about half a peck left... I guess I'll see how I feel tomorrow and try to make some other kind of pickles. Once the cukes and onions (6 cebolla onions from the farm share) were soaking in salt and water, I started shredding 3 heads of cabbage to make sauerkraut. It's my first opportunity to use my new crock! 2 regular green cabbages and 1 Napa cabbage made about 5 pounds, to which I added 3 T. kosher salt and packed into the crock. I topped it with some of the outer cabbage leaves and the special weights that came with the crock. Tomorrow I'll add the white wine and let it sit for a few weeks. The crock has a water seal, but I'll do that after I add the wine. I did use the KitchenAid slicer attachment and it made a tremendous mess, in particular with the Napa cabbage. Doesn't really work so well for that one! Then I turned back to the bread and butter pickles. I had to do them in 2 batches because each batch made 5 pints and I can only fit about 7 or 8 pints in my canning pot. I didn't want to have a repeat of the jar-breaking disasters of the past. See? I can be taught. All in all, I have 10 pints of bread and butter pickles and 2/3 of a peck of cucumbers left. Maybe I'll make more dills, but I do have about 5 quarts left from previous batches. So, not really sure what to do with them. Suggestions are welcome. Generally, I like to post about completed projects but since a couple are in various stages of completion I figured I'd better write them down! 1. 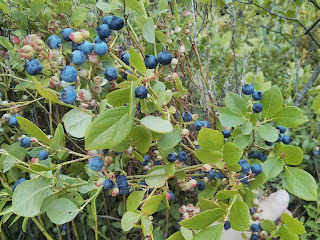 The blueberry season is starting, and I went the other day to my favorite spot and picked a pint of wild berries. There are TONS waiting to ripen so we'll go back in a week and spend the morning to get more. Then I'll make a batch of jam and get some in the freezer for baking/pancakes. I kept dovetailing with a Russian-speaking couple as we all hunted for berries on the hillside. The weather was gorgeous for a change; it was refreshing to be out in the sun for 2 hours on a Friday afternoon! 2. My husband and I started a batch of beer last night. This is a chocolate oatmeal stout. The first stage of the beer-making process always takes more time than I think it will - the grain steeping took 45 minutes and the hops-boiling took an hour. 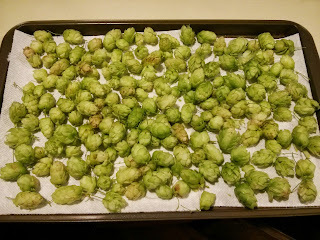 The hops-cooling took even longer! Maybe if we're going to do this more often we will need to invest in a wort chiller. During all this we made dinner, ate dinner, and watched an episode of Sherlock. Not a terrible way to spend a Saturday night! 3. Very soon I plan to start a batch of sauerkraut. I have a regular cabbage and a Napa cabbage and I get to use my new crock! I just need to get some white wine since I like that recipe best. I might even enter this sauerkraut in the fair; if I'm going to enter some of my jams, why not other things? 4. In the past few days I also made a batch of yogurt and have been working through both the farm share and the produce from our mason's garden. I made stuffed zucchini 2 nights ago. The stuffing was onions and peppers sauteed with ground beef, salt and pepper, then the zucchini pulp and some parsley were added. I stuffed these into the parboiled zucchini halves and then topped them with bechamel sauce and baked them for half an hour. They were terrific! I've made this before, but it's worth repeating. This chocolate zucchini bread recipe is fabulous. And it makes two loaves! Even better. The bread came out of the oven an hour ago and we've already eaten half a loaf. No guilt, either, because of the zucchini. The zucchini came to me by way of our mason who asked us over so he could give me things from the garden. We got 2 monster sized zucchini, some celery, peppers, swiss chard, a white eggplant, and a LOT of basil. I'm drying most of the basil; and I have a plan to make a stuffed zucchini with the other one. The rest we'll work through. Soon. 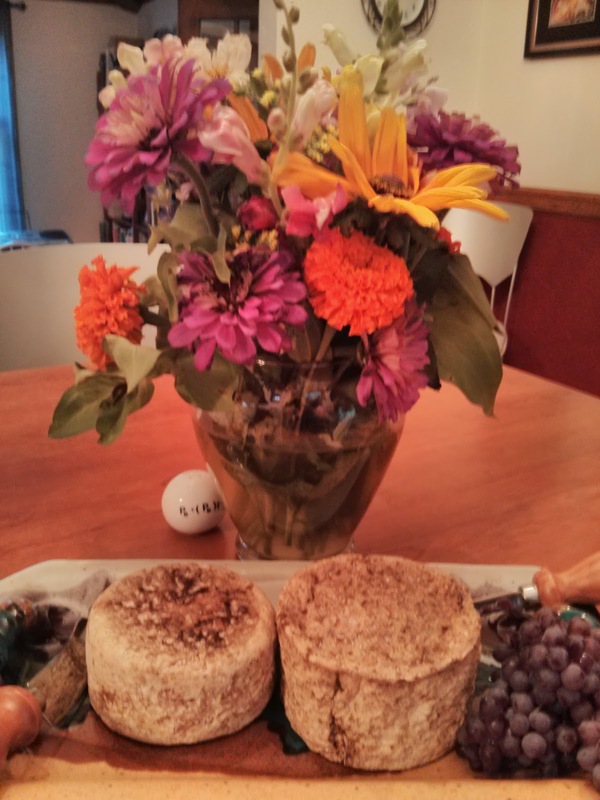 The farm share pick up is tomorrow!